Eventually, almost any railroad will need to cross a creek or river - and then a bridge is needed. Bridges must be able to carry the loads that will travel across them. Some will also need to be high enough to let cars, trains and boats to pass underneath. Some bridges are built high above the water, even in places where tall ships do not operate. This may be done when the railroad line already is much higher than the bottom of a deep valley. Railroads can go up and down hills, but they operate much more smoothly when these ups and downs are gradual. To maintain a level route, high bridges are sometimes necessary. This bridge carries the railroad�s main line across a river in a deep valley, typical of many locations in Pennsylvania, and indeed, across the country. While bridges of this size and style are not rare, they are nowhere near as numerous as the thousands of smaller bridges and culverts that carry tracks and roads across smaller creeks and drainage ditches. Those may be of simpler construction, and of less glamorous design, but they are every bit as essential to the operation of the railroad. 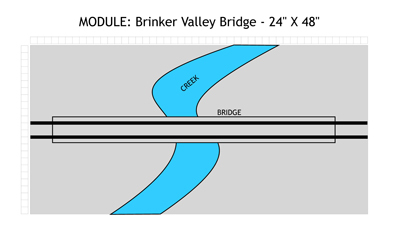 Brinker Pass Bridge while module construction was in progress.